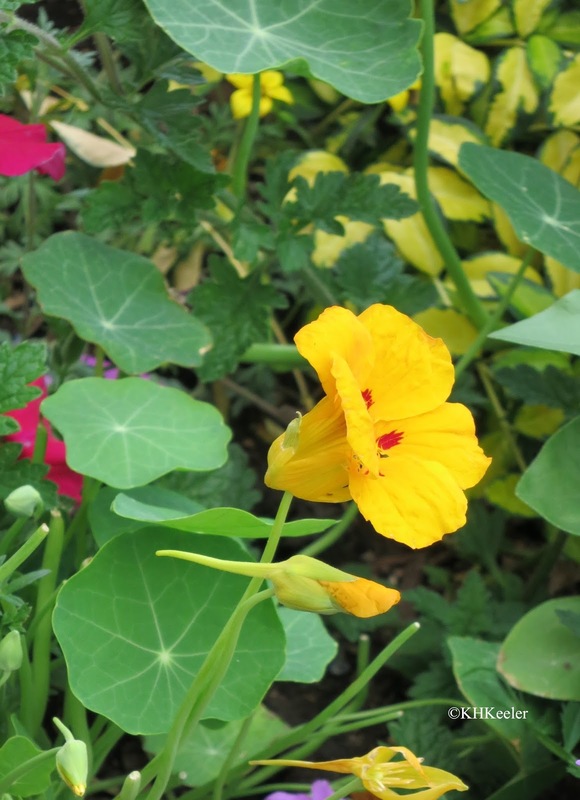 If you have ever looked for nasturtium in the index of plant book, you will have wondered why nasturtium is the scientific name of watercress and the common name of Tropaeolum. Watercress is a Eurasian plant in the mustard family, Brassicaceae, that has been eaten as a vegetable for centuries. The leaves have a sharp taste. The flowers are white but relatively small and not very conspicuous. It was definitely known to the Romans. Linnaeus named it Nasturtium officinale. It has been called Rorippa nasturtium but current opinion is that it is different enough from the rorippas to be kept separate. Nasturtium nasturtium-aquaticum is another name you will also see for watercress, but Nasturtium officinale has precedence and so is the correct name. 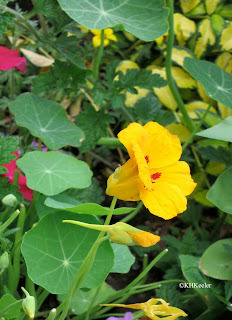 Nasturtium is a yellow or orange flowered plant, genus Tropaeolum majus (plant family Tropaeolaceae). Nasturtiums are native to the west coast of South America . “[I]t is used as a food in Peru today, as it has been for thousands of years” (Kipple & Ornelas p. 1821). Tropaeolum was introduced to Europe from the New World in the late 16th century. In the early herbals, for example Gerard, it is called Indian cress. Nasturtium is not a common word. It seems odd that nasturtium is Tropaeolum and Nasturtium officinale is watercress. This is confusion apparently stems from plant names of the 16th century. Cress today is the word for a number of species in the mustard family. 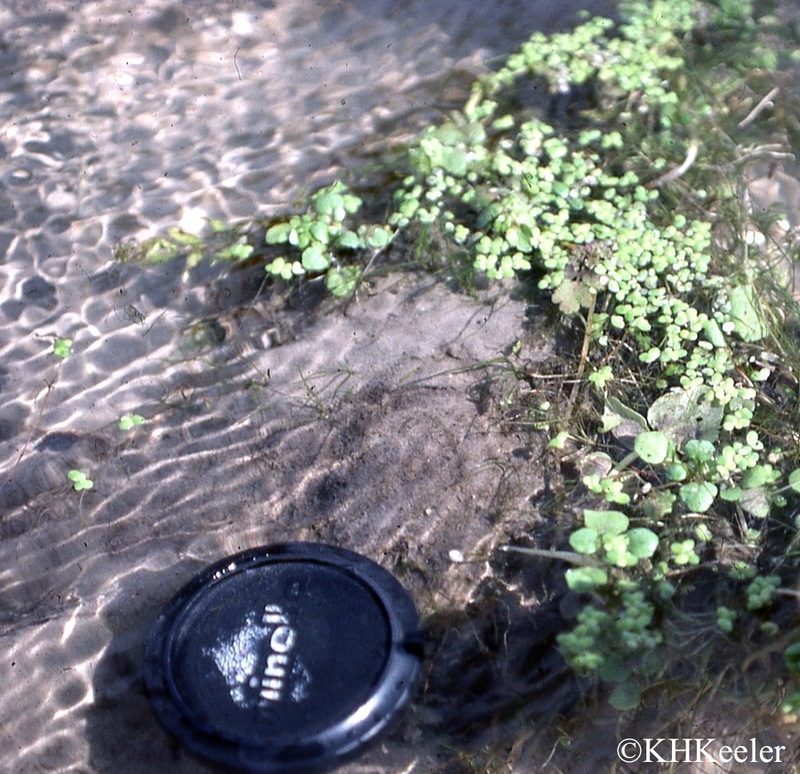 There are native Colorado plants called cresses such as bitter cress, Cardamine. According to Mabey, writing notes to The Gardener’s Labyrinth by Thomas Hill, the first English language gardening book, cress was applied to a wide range of garden vegetables. Gerard’s Herbal (1633) supports this. He lists all these cresses: winter cresses, garden cresses, Indian cress, Sciatica cresses, bank cresses, dock cress, water parsnip, watercress and wild watercress. Gerard calls our watercress Nasturtium aquatica. He called Indian cress (now called Trophaeolum) Nasturtium Indicum. He reports that Indian cress recently came to Europe from the New World by way of Spain. He comments “some have deemed [Indian cress], a kinde of Convolvulus or Binde-weed; yet I am well contented that it retaines the former name, for that the smell and taste shew it to be a kind of cresses.” (p. 252). Today winter cresses (Barbarea), garden cresses (Lepidium) sciatica cresses (Iberis), bank cresses Sisymbrium), water cress (Nasturtium) and wild watercress (Cardamine) are all classified in the mustard family, Brassicaceae. Mustard leaves have a sharp spicy taste. The others called cresses in 1600 are currently recognized as members of different plant families: dock cress (Lapsana) in the sunflower family Asteraceae), water parsnip (Berula and Sium) in the dill family Apiacaeae) and nasturtium (Tropaeolum majus) in the Tropaeolaceae, the nasturtium family. Part of the confusion comes from the fact that the Latin for “cress” was nasturtium. “Cress” covered many sharp-tasting plants. 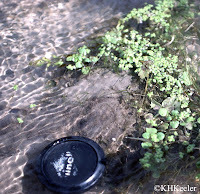 Linnaeus named watercress Nasturtium officinale. "Officinale" means "of the office," that is, the cress you can buy in shops, the commercially important cress. The common name drifted from nasturtium or nasturtian to be watercress. Coming from the Americas Tropaeolum majus was initially lumped with the cresses. It took and kept the common name nasturtium. In the meanwhile, botanists decided that despite its sharp taste, Tropaeolum did not belong in the same family as watercress, bitter cress and garden cress, and put in a distinct plant family Tropaeolaceae. So both nasturtium and watercress have a sharp taste and they have both been called cresses, in English and in Latin. “I am afraid there are still a number of ‘misprints’ in Vol. 1 (The Fellowship of the Ring was published on 19 July 1954) including the one on p. 166. But nasturians is deliberate, and represents a final triumph over the high-handed printers. Jarrold’s appear to have a highly educated pedant as a chief proof-reader, and they started correcting my English without reference to me: elfin for elven; farther for further; try to say for try and say and so on. I was put to the trouble of proving to him his own ignorance, as well as rebuking his impertinence. So, though I do not much care, I dug my toes in about nasturtians. I have always said this. It seems to be a natural Anglicization that started soon after the ‘Indian Cress’ was naturalized (from Peru I think) in the 18th century; but it remains a minority usage. I prefer it because nasturtium is, as it were, bogusly botanical, and falsely learned. We could follow Tolkien and call Tropaeolum Indian cress. However, that doesn't make things clearer, because today, cresses are mustards, since most of the non-mustard cresses have developed alternate common names. Tropaeolum isn't a mustard. Nasturtian is too similar to nasturtium to be helpful. Nasturtium vs watercress is clear; Tropaeolum vs Nasturtium is clear. Enjoy their strange historical relationship. Al-Shehbaz, I. A. and R. A. Price. 1998. Delimination of the genus Nasturtium (Brassicaceae). Novon. 8: 124-126. Carter, H., editor. 1981. The letters of J.R.R. Tolkien. Houghton Mifflin Company, Boston. Gerard, J. The Herbal or General history of plants.Complete 1633 edition as revised and enlarged by Thomas Johnson. Dover Publications, New York 1975. Kiple, K. F, and K. C. Ornelas, editors. 2000. The Cambridge world history of food. Cambridge University Press, Cambridge UK.